← I have not abandoned mittens. I love you, Uncle Walter. There are a few people you meet once, who change the direction of your life entirely. One of mine was my mother’s Uncle Walter. 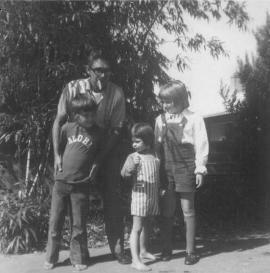 I must have been five years old or so, and he and his daughter Bonnie came out from Atlanta to visit us and his sister, my Grandma Wina. Those of you who have followed me for a few years may recall when I went to clean out her house. The big kids, particularly my brother Chris, were teasing me again. As the youngest of four I was subject to frequent teasing; in my mind, constant torment. I developed my own escape methods, many internal. 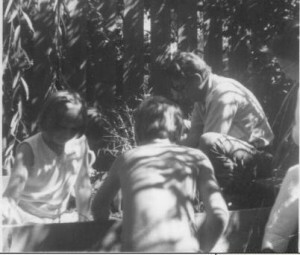 On this day I went to play in our giant back yard sandbox. After some time, Uncle Walter came to find me, and he got in the sandbox, too. He gathered a few leaves, some grass and lawn flowers, and together we made miniature Japanese gardens in the sand. A short time after that, Chris and then my sister Traci joined me. And for the first and only time I ever remember, we played quietly together, with no hitting or teasing or fighting. Just played quietly, making miniature Japanese gardens in the sand box. I can’t see a vine maple today without being instantly relaxed. Walter was my grandmothers only brother, and it was his daughter (not Bonnie) who came out to help take care of her estate. Would you believe that at 84 he was online and active? We emailed frequently until two years ago or so; He sent me pictures of his garden and the neighbor’s Jenny; poems by his father and Pablo Neruda. His vision and health were fading and I was busy. I meant to go visit him in Atlanta but never managed to schedule the trip. This afternoon as I was cleaning out my email I found a note from Uncle Walter. Written by his daughter, he had passed away peacefully at home on Friday morning. It would be too easy to fall into sadness and regret never having gone to see him. I wish we had met again, but there is also a great deal of comfort keeping him as the kind, quiet, gentle man who made the teasing stop. At the darkest places of my life, when I couldn’t imagine anyone caring about me or loving me at all, there was always Uncle Walter, right up there next to Mister Rogers and Jesus. No matter what, I knew he loved me. I know he does now. I am less sad at his passing (we all do) than I am grateful that I had that one time. One perfect moment of childhood forever enshrined. Upon the fertile brain of man. And some predictions will come true. “Our leader saw the future. He spoke with God, who told him thus and so. When others listened just as eagerly? Before I choose my Path? I could believe, perhaps, that one. I will wait for God to speak direct to me. 2 Responses to I love you, Uncle Walter. Beautiful. Whether you saw him in person or not, you kept in touch, and for an elderly man who hadn’t gotten to see you in person in so long, you gave him as great a gift as he gave you.